1. Selling a joint venture with a 50% stake at a price of $4.3 million. The joint venture is principally engaged in the spinning business in Vietnam. The loss after taxation in 2017 was US$ 7.58 million, which means that Luen Thai will have to bear a loss of US$ 3.79 million for this joint venture in 2017. Upon completion of the transaction, Luen Thai’s loss from the joint venture company will be significantly reduced, and a one-off gain of approximately US$1.5 million will be recorded. This entry was posted in Investment and tagged Luen Thai on 18 October, 2018 by Wai Gor. Luen Thai Holdings (311.HK) is a long-established manufacturer of ready-to-wear and apparel accessories in Hong Kong. It was founded in 1983 by former major shareholder Mr. Chen Shouren. It was listed in Hong Kong in 2004 and finally sold to Shanghai at a price of 1.8 yuan per share in 2016. Textile Group. 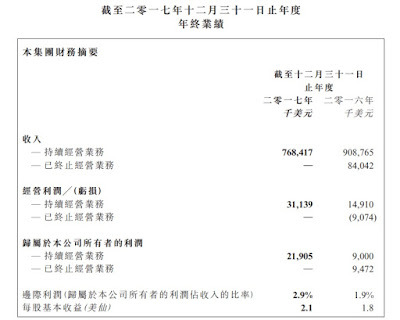 After the completion of the sale, due to the public shareholding of less than 25% and has been suspended until January of this year, only through the Shanghai Textile Placing reduction of 40 million shares and the original major shareholder Mr. Chen Shouren held 16.82% of the shares scattered to the friendly holding, thus Resumption of trading after reaching a public shareholding of more than 25%. 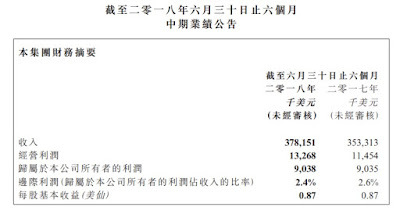 Of course, the nominal public shareholding is as high as 26.65%, but in fact the public shareholding may not be higher than 10%, only because the original shareholder Chen Sheng’s shareholding is only scattered to friendly holdings and has not been sold in the market; Shanghai Textile has reduced its holding of 40 million shares at 1.08 yuan per share. Only less than 20 million shares are circulating in the market. About 22 million shares are still held by a single large household. The company’s first full-year results after the completion of the sale (ie 2017) are really good and high interest rates are distributed. The 2017 annual results of earnings per share of 0.165 Hong Kong dollars, the annual dividend of about 0.1 yuan, dividend payout ratio of up to 60%. In the first half of 2018, the results were not bad, but the dividend payout ratio fell to 30%. I wonder if it is necessary to retain funds for the acquisition? The company subsequently announced a sale and an acquisition transaction last month, and the two transactions I think are all good, let’s talk about it later. In addition, it will also briefly talk about the company’s concerns. This entry was posted in Investment and tagged Luen Thai on 15 October, 2018 by Wai Gor.